The ever-stylish Jodi Kostelnik, in her signature pink and purple glasses, welcomed me to her red and yellow house, a perfect reflection of her personal style with lively and bright artwork. Treating me to a heavenly spread of lemon pound cake and black coffee, Jodi told me all about how she recently discovered Park Slope and Café Regular and, in her first days in the neighborhood, demonstrated her Regular-ness by instagramming a photo of our takeout coffee cup against her blue and white polka dotted shower curtain. 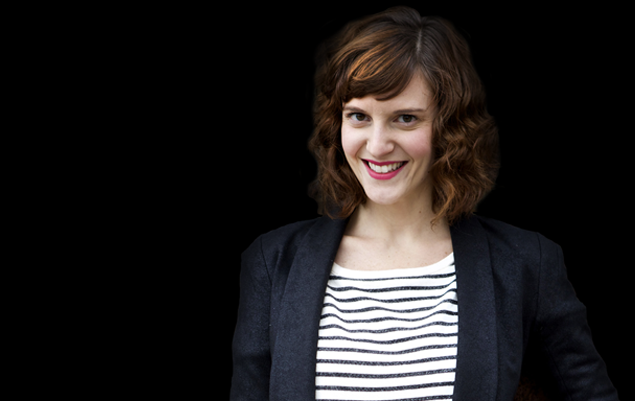 Jodi is a graphic designer and entrepreneur who runs two businesses, each with stand out style. 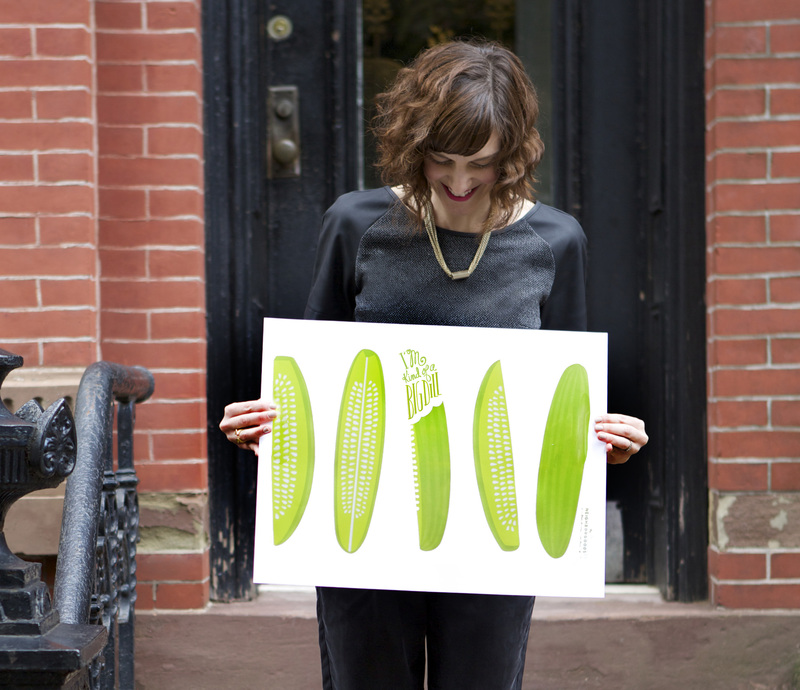 Her first business— Hello Neighbor Designs — is a design business, focusing on branding and packaging for food clients. 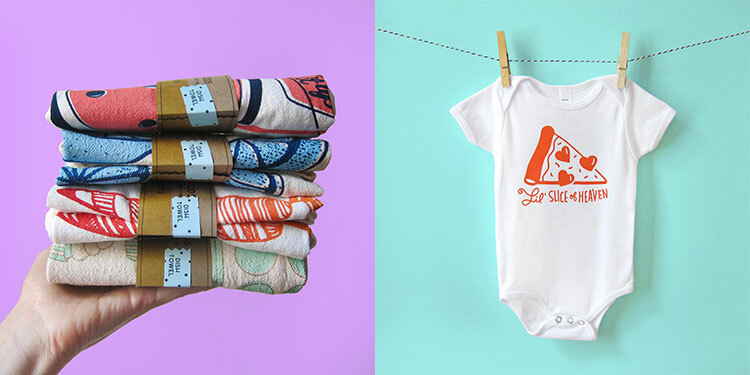 Her second business— The Neighborgoods —is a screen printing business creating dishtowels, tote bags, and onesies—all food themed. Jodi developed her passion for art in high school and followed her instincts through college, all the way to Greenpoint, Brooklyn. She landed her first design job at a boutique studio in New York City. She learned everything she needed to know about running her own business during that year, but the workload and stress level also left her feeling burnt out. Trying to avoid burnout so early in her career, she moved on to one of the larger ad agencies right smack in Midtown, working in the healthcare department. Life in the corporate world had its ups and downs. It was less exhausting, but also less interesting, and the hours were just as long. This time, she would spend hours sitting around, waiting for approval on every aspect of her assignments. “I would ask myself ‘what am I doing?’ I’m here all hours of the day and not even working on any portfolio-building work.” At a certain point, Jodi befriended a coworker from her first job: “She came over to hang out in Greenpoint one day, and never left...literally. She moved in with me and asked me if I wanted her freelance clients.” Jumping at the opportunity for more exciting work, Jodi began tackling side projects during an occasional evening or weekend. But she kept getting busier and busier. She quickly found herself working all day at her agency, and then coming home to work more for her freelance clients. Jodi would eventually decide that she needed to take the plunge and give her freelance design business a chance. “I told my boss that I was doing a lot of freelancing on the side, and I wanted to see where it would go. He was like ‘Omg I know. You are way too cool for this place. Do it!’” With that—albeit a mere 25 years-old—Jodi’s journey as an entrepreneur began. Finding a focus didn’t happen overnight. Jodi put a lot of thought into what inspired her artistically and visually. She realized how inspired she became when she visited the Farmer’s Market. The colors and patterns spoke to her, playing right into her imagination. As someone who enjoys baking (cupcakes are her favorite), she decided to blend the beauty of food and art together. She also hired a career coach. Justine Clay, Jodi’s coach, helped her turn desire into action. Her investment with Justine was well worth it. “I was ready for a new phase. I had a specific style and knew what jobs were not a right fit for me. I learned that saying “no” more than “yes” is so important in being able to grow.” Jodi also enjoys working specifically with small businesses; because she can relate to the passionate owners she collaborates with. Jodi has also found another way to express her creativity beyond her design business. “Within the last year I started The Neighborgoods — my screen printing business.” Jodi leaped up to give me the tour of her products. I was impressed by the eclectic collection of dishtowels and posters. They were perfectly playful, bold and humorous; I could immediately imagine them in a sun-lit Brooklyn kitchen. KEEP IT ACTIVE: Post at least once or twice a day! Keeping your account active keeps your followers engaged and allows new followers to find you (through hashtags on images you post). BE AUTHENTIC: People want to know your story. A lot of people make dishtowels but it’s about getting to know the person behind the brand, that is what makes your business stand out from the others like it—you. Be sure to curate to your target audience’s interests, and try to change it up by showing different aspects of who you are. Sometimes I throw in a pic of my dog (he’s really cute, how could I not?) or the food I am making, eating, or buying. FIND YOUR COMMUNITY: Find out who your target audience is and reach out to those people. Schedule in time to connect with them! Looking for more tips? Jodi is collaborating with a photographer, Evi Abeler, and putting on a workshop titled “How to Use Instagram to Grow Your Business,” on June 10th at In Good Company, from 1pm-3pm. You can check out more info and sign up here. Can’t make it? She’s also presenting a FREE online webinar this Monday night, June 8th at 8pm EST, through Maker Mentors. Sign up through the link to listen in. © 2010 - 2019 Café Regular, LLC. All Rights Reserved.